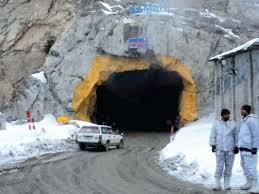 Work on Lowari Tunnel located on Nowshera-Dir-Chitral Road (N-45) would be completed in three years. A National Highway Authority (NHA) official said on Wednesday that the delay in the construction work on the project worth Rs 18 billion was due to 2011 floods and disputes over payment between the Korean construction company SAMBU and the NHA. He said when the Lowari Tunnel project began in 2005, it was planned to be constructed in two phases. In the first phase, the 8.54 kilometers long tunnel was to be constructed along with access roads and in the second phase, a railway track was to be laid. The main tunnel had 7.14 meters maximum height and 7.55 m maximum width, with a 9.3 km long access road from Dir and 9.2 km long road from Darosh. The auxiliary tunnel was two kilometers long. The project could not be completed in October 2008 as planned. In October 2009, the then government decided to change its design from that of a rail tunnel to a road one. Work on the project was discontinued again in June 2011, primarily due to financial constraints. As many as Rs164 million were allocated under the 2010-11 Public Sector Development Programmes (PDSP) but most of the funds had not been released. Being one of the longest tunnels in Asia, the Lowari Tunnel was of great national importance and would contribute to the socio-economic well being of the area. After its completion, rich mineral and other natural resources of the area could be exploited, which would promote trade. Lowari Tunnel is situated in Khyber Pakhtunkhwa (KP), connecting Dir and Chitral valley. The idea of the tunnel was originally conceived in 1956 and work on it began in September 1975, but was stopped in 1977 due to lack of funds and other developmental projects. The work on the tunnel could not restart until September 2005. When completed, the tunnel would cut down the current 14-hour-long drive from Chitral to Peshawar to only seven hours.